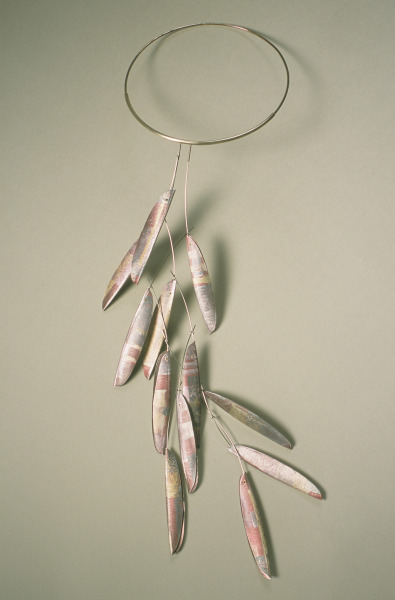 Two-part neckpiece, with a silver wire choker and twelve pale-coloured aluminium sheets shaped into pods dangling from the silver wire. Dyed and crazed anodised aluminium, silver tube and stainless steel wire and 9ct gold tube rivets. Anodised aluminium sheet is block printed and dyed and milled to stretch and craze it. Fabricated silver neck collar and stainless steel wires. 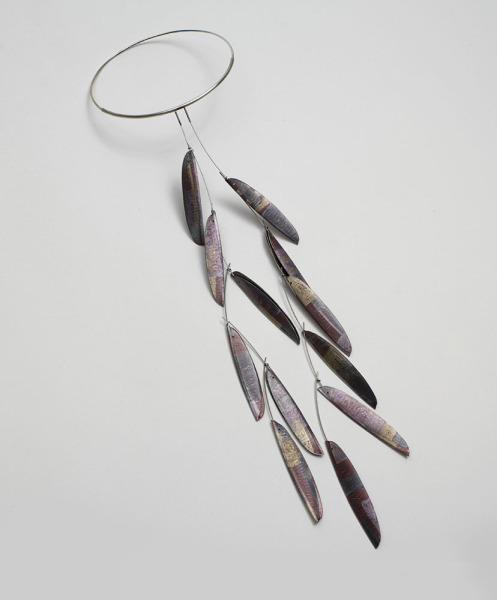 Neckpiece: 12 Red Pods, Jane Adam, 1999, Crafts Council Collection: J271. Photo: Todd-White Art Photography. As a true one-off piece, this neckpiece is a relatively rare excursion for me, a basking in the luxury of making for the pleasure of creation. It explores the sensuality of jewellery, the restriction and simplicity of the silver collar contrasting with the cascade of pods which moves and falls across the torso - the centre of one's being.